Kansas City’s booming changes and developments are on fast tracks. The first of the tracks for Kansas City's streetcar initiative have been laid down this year and the project is slotted to be complete in 2015. On our third day of the '12 days of Why it’s great to be in Kansas City', Block Real Estate Services (BRES) will highlight the development of our city’s first streetcar project. Kansas City’s Street Car initiative was passed last year after 697 downtown registered voters mailed in their election votes. The streetcar is said to run for two miles stretching from the River Market to Union Station. The streetcars will include stops with shelters and seating. Introducing the streetcar into Kansas City’s culture comes with the hope for more efficient transportation. Read more about the KC Council’s Streetcar Plan Timeline. 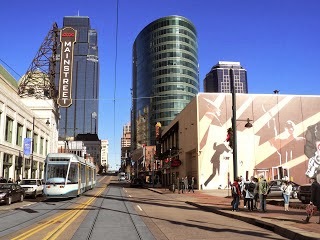 Kansas City’s streetcar is one of many redevelopment goals for the city. The addition of the streetcar hopes to revitalize the downtown core and bring commerce to the area. Mayor Sly James hopes that Kansas City’s redevelopment efforts will attract more traffic and business to the downtown area. The goals of the streetcars are to improve mobility, add value to downtown properties, and attract new commerce to Kansas City. The Mayor and KC’s city council are determined to make Kansas City a more developed attraction rather than a place simply fly over. With 2014 quickly approaching, the Kansas City Council is thinking ahead in smart planning. Recently, the council has established approval for studies of a bigger streetcar system that could potentially stretch from the Country Club Plaza to East of Main. The proposed research is investigating a potential growth in efficiency of public transportation across the urban core with KC’s streetcar system. Read more about Kansas City’s Expansion Study Efforts. Kansas City is on the fast tracks to redevelopment and growth. The streetcar initiative is one of many efforts in progress that is striving to create revitalized downtown that creates commerce and an easy functioning city. It’s a great time to be living in Kansas City! Review BRES Market Report: How Streetcars Will Shape Downtown Kansas City for additional details. 2014 KC Market Report Coming in January. Click here to sign up now!